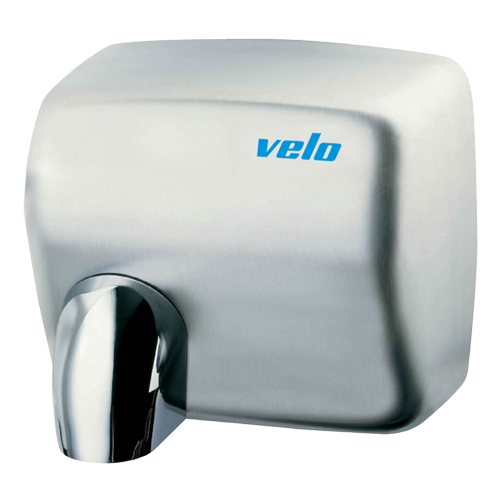 The classic Velo Cyclon hand dryer is one of the fastest, durable and reliable hand dryers in its class. It’s well suited to a wide variety of high traffic situations e.g. Sports stadiums, schools, petrol stations, public washrooms, hotels, airports, clubs and offices. One of the most energy reliable, fast and durable hand dryers in it’s class. Dimensions: 240 x 265 x 210 mm. Total electric power: 2450 W.
Approximate drying time: 28 seconds. Casing: AISI 304 stainless steel, thickness 1.5 mm. 230 V / 50 – 60 Hz. Also available 110 V / 50-60 Hz. Motor: 6500 r.p.m. & 250 W power. Heating element power: 2450 W.
Motor protection: fuse. Resistance protection: internal thermostat. Air temperature: 53 ºC at 10 cm. Dimensions: 240 high x 265 wide x 210 deep mm.